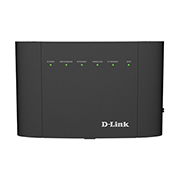 The D-Link DSL-3782 is an AC1200 wireless dual-band modem router, suitable for home networks, as well as for small offices, incorporating both the functions of an AC1200 router and the versatility of the integrated ADSL2+/VDSL2 technology (which ensures download speeds of up to 100 Mbps). D-Link is a well-known Taiwanese multinational manufacturer of networking equipment, which focuses towards both home users and small businesses (its products covering the network switches, IP cameras, routers, modems and firewalls). 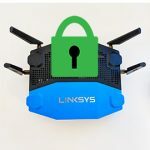 Also, since it’s been founded about three decades ago, D-Link went from being a network adapter vendor to becoming a market leader in the Wi-Fi product shipments worldwide. 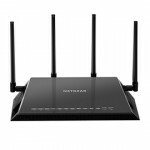 The release of the DSL-3782 last year, proves that although most vendors have moved far past the AC1900 point (there are AC3200 and AC5300 routers out there), D-Link hasn’t abandoned the entry-level router market and understood that most people don’t need high-end devices with technologies that can’t even be used properly yet. That being said, the DSL-3782 should be miles ahead the N-technology and should give its users a nice taste of the AC-technology, while nullifying the need of a separate modem. 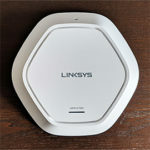 Over the years, I’ve noticed that D-Link likes to break the patterns when it comes to the design choice of its routers. There are the cylindrical DIR-830L and DIR-860L, the newer, beetle-like DIR-895L/R and DIR-890L/R and the rectangular, vertically positioned DIR-810L which does not have any external antennas. 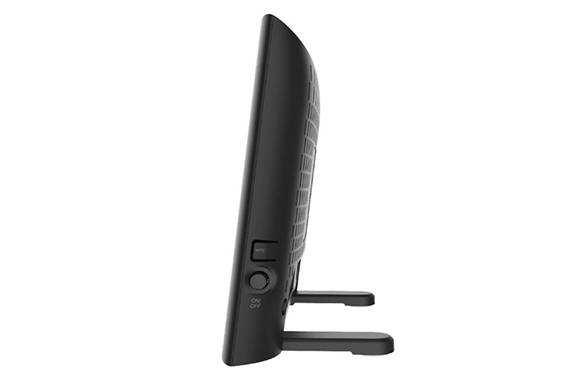 The DSL-3782 follows the same pattern, featuring a simple square piece of plastic covered by a black matte finish (which does not retain fingerprints), with the front and the back sides slightly curved and completely lacking any external antennas (there are two internal dual-band antennas). Because we are dealing with a minimalistic design, the DSL-3782 is suitable for a living room and it doesn’t attract too much attention on itself, blending in nicely with the furniture. 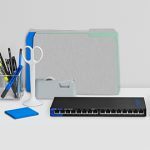 By default, the modem router can be positioned vertically and, unfortunately, that’s the only available posture, meaning that you won’t be able to lay it flat on the table, nor mount it on a wall. 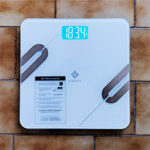 Sure, in some crowded offices, it may feel as an inconvenience, but the truth is that the device isn’t really that large (it measures 8.27 x 5.91 x 1.21 inches) and the footprint is really narrow, so it can be slipped onto a shelf. 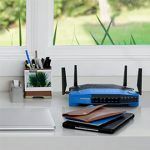 The vertical stance of the device implies that stability is very important, but D-Link handled things at a reasonable level, adding two sliding feet with rubber pads which, so far, have proven to keep sturdy the modem router (although the device isn’t very heavy, weighing no more than 0.24 pounds). Usually, dual-band modem routers tend to get a bit warm, which means that you must be careful where you position the device so you don’t obstruct the airflow vents. D-Link DSL-3782 has lots of vent holes on the top and on the back (which surround a recessed zone for the label which contains info about the device – the MAC ID, the Serial Number, the default web address, user name and password, as well as the two SSIDs for the wireless bands and the passwords for each). On the front of the DSL-3782, towards the top there is an array of LED lights which show the status of the Power, Broadband (if it’s solid green, it means that there is a proper DSL connection, otherwise, if it’s blinking, it means that the DSL port is negotiating a connection), Internet (solid green means that there is an Internet connection, if it blinks, it means that there is Internet activity; if it’s solid red, then there is a PPP or DHCP failure), Wireless (if the LED blinks, it means that there is wireless activity), Ethernet and WPS (if the LED blinks a green light, then the WPS process is active). Turn the modem router around and you can find a series of ports and buttons: from the left, there’s the Power Connector, a USB 2.0 port (which allows you to share media content using a flash drive or any other type of external storage device), four 10/100M Fast Ethernet LAN ports, a recessed Reset button (press and hold the button for 5 seconds, using a paper clip in order to reset the device to its factory default settings) and the RJ-11 Broadband DSL port (which connects to a DSL-enabled telephone line). 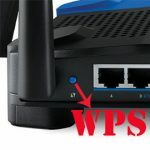 On the right side of the DSL-3782, there’s a subtle WPS button (press the button to automatically create a secure connection with a WPS client) and a more prominent ON/OFF button. 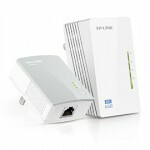 Note: Inside the package, you can find the D-Link DSL-3782 modem router unit, a Power Adapter, an Ethernet cable and a Phone (DSL) cable. Inside the case, the D-Link DSL-3782 is equipped with a Mediatek MT7511T CPU, 512MB DDR2-800 SDRAM (Winbond w9751g6kb-25) and 128MB of flash storage (MXIC MX25l12835F M21-10G). The 2.4GHz wireless performance is being delivered by a MediaTek MT7592N 2×2:2, 802.11b/g/n chipset and the 5GHz wireless performance is being delivered by a Mediatek MT7612E chipset. Because of this internal hardware, the DSL-3782 features a maximum theoretical speed of 300 Mbps using the 2.4GHz radio band and a maximum of 867 Mbps using the 5GHz radio band (which add up to 1167 Mbps, rounded to 1200 Mbps). 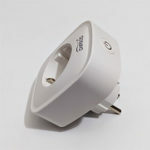 Furthermore, the DSL-3782 switches automatically to a Power-Saving mode if one minute has passed without any data packages transmitted or received (ERP). In Stand-By mode, the modem router uses approximately 4.7 watts (0.18 if it’s switched off). The DSL-3782 is a capable modem router and thankfully, D-Link has added some of the latest technologies which are usually found on devices of a higher price tag. There is the concurrent dual-band feature, which allows you to use both the 2.4 and the 5GHz radio bands at the same time, working with compatible devices connected from both spectra. 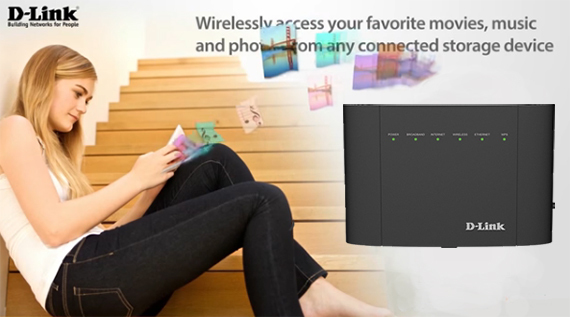 The DSL-3782 also uses the AC Beamforming technology to further maximize the speed and range in a very interesting way: instead of broadcasting the signal everywhere (the old way) hoping to reach your wireless devices, the modem router scans all connected clients and focuses the signal towards them, thus greatly improving the signal quality and the way your network behaves. You may have heard the MU-MIMO technology as being the next best thing in the networking world and sure enough it’s something to keep an eye out, but, unfortunately, it’s not a feature that will make much sense right now for many people. The way it works, is that it can serve multiple users at the same time (multiple-input and multiple-output) instead of the round-robin technique, where a user will be served at a time. 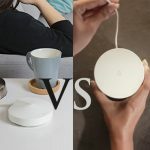 The problem is that this technology requires powerful hardware to function with a lot of devices at the same time (higher price) and you need compatible wireless adapters to connect to the router (which are not widely available and very expensive), therefore, making it a feature for the future instead of the present. 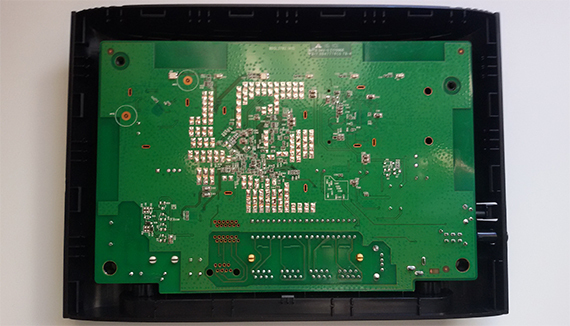 Obviously, the DSL-3782 uses the SU-MIMO technique, so it will serve a client at a time (as expected, considering the price point and since the main selling point of this modem router is simplicity). Since the DSL-3782 has four Fast Ethernet LAN ports (therefore it supports 10/100 Mbps Internet connections), the routing performance is capped at a maximum of 100 Mbps and the tests have shown this to be true: I measured an average of 90.4 Mbps and a maximum of 93.6 Mbps. Furthermore, in order to test the wireless capabilities of the modem router, I got two computers with an AC-compatible wireless adapter, connected them to the router and measured the speed of the data being transferred between the two clients. So, using the 2.4GHz radio band, in close proximity (no more than 5 feet), I measured a maximum of 72.8 Mbps (on average, 71.5Mbps) and after increasing the distance to 15 feet, the speed decreased to 64.6 Mbps. Afterwards, I tested the wireless performance at 50 feet and the speed decreased to 37.5 Mbps. Surprisingly, at over 200 feet, I could still watch videos on YouTube and view my emails using my smartphone. Next, I switched to the 5GHz radio band (the 802.11ac standard) and at close range (no more than 5 feet), I measured a maximum of 223 Mbps (the speed averaged at 178 Mbps). After I increased the distance between the clients to 15 feet, the speed decreased to 149 Mbps and lastly, at 50 feet, I got only 33 Mbps (because of the Fast Ethernet ports limitation (10/100Mbps), the tests using the 5GHz radio band were a lot more sensitive to external factors than usual, therefore the poorer results than the other devices from the competition). Now, since the D-Link DSL-3782 uses the ADSL2+/VDSL2 technology (the best you can get going using this setup), the maximum Internet speed can be 100 Mbps. 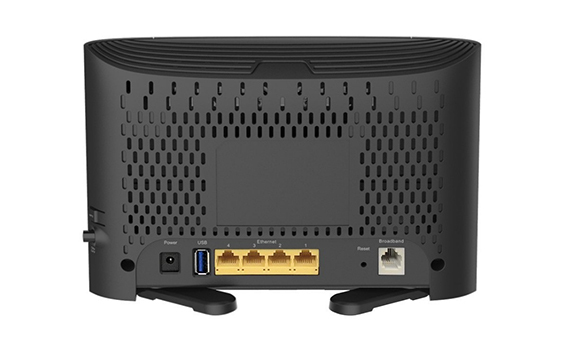 Note: Although it’s an AC-modem router, the DSL-3782 is fully backwards compatible with the 802.11a, 802.11g and 802.11n standard, so it can connect with devices that support an older wireless technology. To perform the hardware setup, you need to connect the provided DSL cable to the wall jack and to the Broadband port on the modem router (unfortunately, there is no WAN port, so you won’t be able to use the DSL-3782 as a standalone router). Afterwards, connect the modem router to a power source using the Power adapter and, in order to setup the device, you need to connect it to a computer by using the provided Ethernet cable (use any LAN port from the modem router – the setup process can also be initiated by connecting to the default WiFi network, using the user name and password printed on the label). Now, you can open a web browser and go to either https://dlinkrouter.local/ or https://192.168.1.1 to access the interface (if accessing it for the first time, it will automatically run the setup wizard). The Setup Wizard guides you through a step-by-step process to connect the device to the Internet (choose the WAN Access Type, the Country and the ISP and insert the user name and password provided by your ISP), configure the Wireless Network (insert the 2.4GHz and 5GHz SSIDs and passwords) and some general system settings (choose a new Admin password). Sure enough, you can also let your router to automatically select the ISP settings for you. 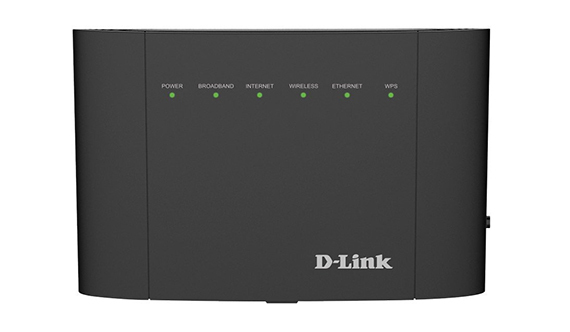 After you are done with the initial setup, you gain full access to the D-Link interface so you can perform a more in-depth configuration of your modem router. If you remember the old black and orange D-Link interface, well, things have changed a lot. The new UI is extremely clean, minimalistic and perfectly suited for people that aren’t tech-savvy, holding your hands at every point in the configuration process (every section and setting has a brief description about what it does), therefore, making it perfect for undemanding users. Overall, everything about the new interface is designed to ensure that the connection to the Internet is fast and straight-forward, D-Link focusing more towards the ease-of-use and a bit less on sophisticated features. That being said, it still has everything one would expect from a router modem, so let’s have a closer look. On the top side, you can find the main tabs for Home Settings, Features and management. 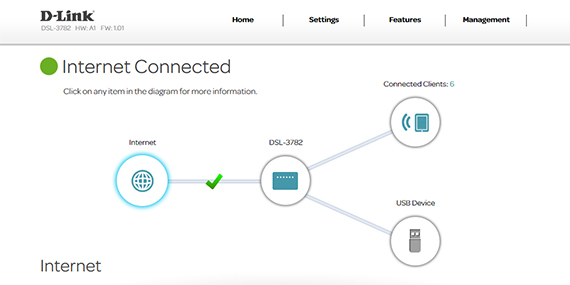 The Home tab shows a graphical representation of your network, with the connected clients and USB devices, the Internet and the DSL-3782, allowing you to click on each item, to see its status or go to settings. 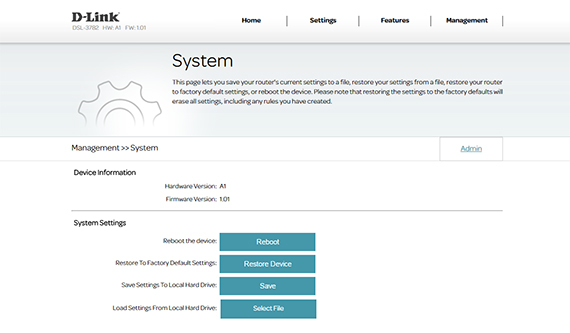 The Settings section gives you access to the Setup Wizard (you can rerun the wizard whenever you need to change something), Internet (choose the WAN connection, configure the ADSL/VDSL VC Setting – Interface, Virtual Circuit, VPI, VCI, Service Category and Vlan ID, if applicable; WAN Settings – can be Dynamic IP Address, Static IP Address, PPPoE or Bridge Mode; WAN – some of its options include the Connection Type, the MTU, Enable NAT, Enable PPPoE Passthrough), Wireless (here, you can configure the 2.4 or 5GHz radio networks, its options including the Cipher Type, WMM, Signal Interval, DTIM, Transmitting Power, the 802.11 Mode – you can’t choose to use only the AC mode -, Channel Width and Schedule; here, you can also create 2.4 or 5GHz WiFi Guest Networks, so your private data won’t be visible to anyone but you), Network (includes Router Settings, such as choosing the IP address and enabling/disabling the DHCP Server, as well as configuring the UPnP) and USB (DLNA Settings and Samba Setup). The Features section includes the following options: Firewall (DOS and Portscan Protection, SYN/TCP reset attack, Ping/Ping of Death attack, Null scanning attack, etc. ), Application (open single or multiple ports in your firewall when the modem router detects that data is being sent to the Internet using an outgoing “Trigger” port), ACL (allows you to use telnet or the Web to manage the modem router remotely), Port Forwarding (allows you to create up to 64 rules for Port Forwarding and 8 rules for DMZ), IP/MAC/Website Filtering (a form of Parental Controls, which allows you to create rules based on the IP and MAC address, as well as set specific websites in order to filter what users can access on the Internet – you can also add schedules), Static Route, Dynamic DNS and IGMP (here, you can enable Snooping Support, PVCI Proxy and IGMP V1/V2/V3). The Management section has the following options: Time and Schedule, Log Info, System Settings (here, you can Reboot the device, restore to factory Default Settings and save and load Settings to Local Hard Drive), Firmware Upgrade, Statistics (like statistics about the Internet, LAN and the two wireless bands) and Diagnostics (allows you to run diagnostic tests, like Ping and Traceroute to see if the broadband is working properly). 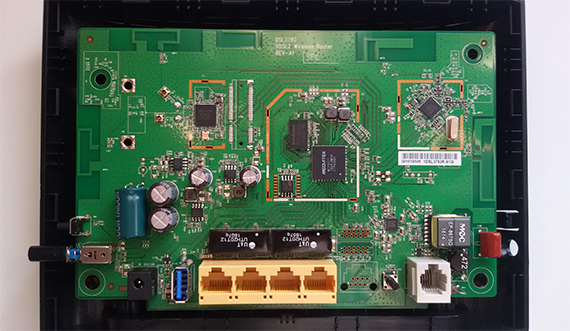 Note: Modem routers cannot be flashed with custom, non-ISP firmware (like DD-WRT, Tomato or OpenWRT). It’s true that ADSL/VDSL modem routers aren’t really known for their great wireless performance, but, regardless of that, the D-Link DSL-3782 is an acceptable performer using the 2.4GHz radio band, has a simple, minimalistic design that doesn’t attract too much attention towards it and has a very straight-forward, user-friendly interface, all that along with the ADSL2+/VDSL2 modem capabilities. 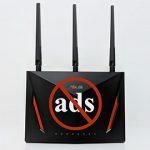 This makes the modem router a very attractive device for most people that want their network to just work and not have to do any in-depth configuration. Still, there are some major minuses to take into account before purchasing, like the lack of Gigabit Ethernet ports and the relatively slow 5GHz performance, comparing it with the competition. According to D-Link’s website it has a USB 2.0 port instead of USB 3.0, are you sure about your description, or? I checked again and it does seem to be equipped with a USB 2.0, so I made the necessary changes. Thank you for informing me!